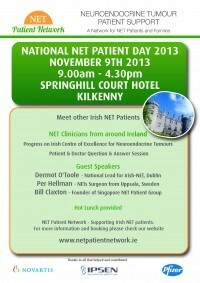 The National Patient Day 2013 has been confirmed for Saturday November 9th in the Springhill Court Hotel in Kilkenny. The day will start with registration and tea/coffee between 9 and 10am. 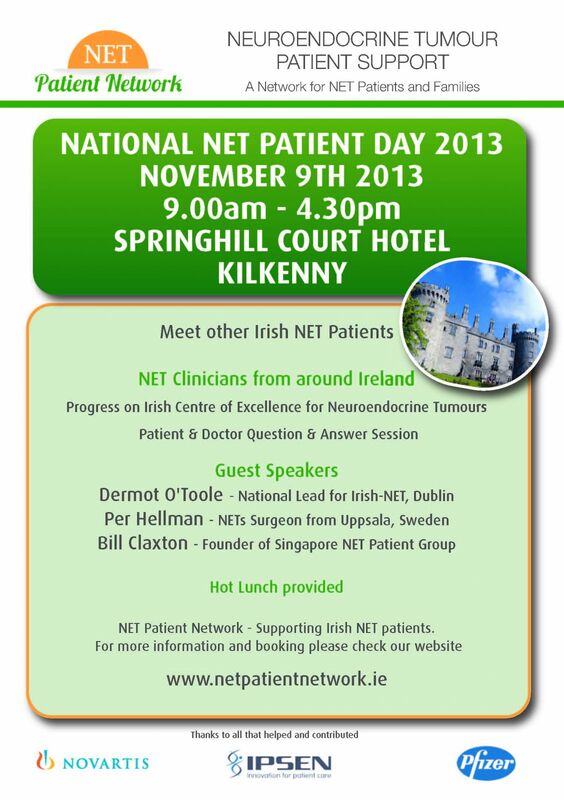 In the morning session we will have presentations from Dr Per Hellman, a NET surgeon, from Uppsala Neuroendocrine Centre of Excellence in Sweden and an online presentation by Mr Bill Claxton a pioneer in setting up NET patient support groups who will share his experiences in how NET patients can work together to improve services in their country. Following the morning session, we will break for a hot carvery lunch. In the afternoon session, we will be joined by Professor Dermot O’Toole (the newly appointed National Lead for Neuroendocrine Tumours) who will address our gathering with general information on NETs and how the plans for an Irish NET Centre of Excellence is progressing. Professor O’Toole will be accompanied by his colleagues from St Vincent’s University Hospital (Prof Donal O’Shea, Mr Justin Geoghegan and Mr Donal Maguire), Mercy University Hospital Cork (Mr Criostóir Ó Súilleabháin and Dr Derek Power) and Galway University Hospital (Dr Greg Leonard and Dr Marcia Bell). Following presentations, the clinicians will participate in a question & answer session. The Q&A session is always very popular, and very helpful to patients, both to have their questions asked and answered and to hear other patients questions. Professor O’Toole will frame his presentation around questions asked in advance via this website. If you want to raise a question, post your question in our forum (click here). All questions raised will be relayed to Prof O’Toole prior to the event. We hope that everyone can join us on the day. If you are planning to attend, perhaps you can send us an email to info@netpatientnetwork.ie so that we can correctly plan for our food requirements on the day.